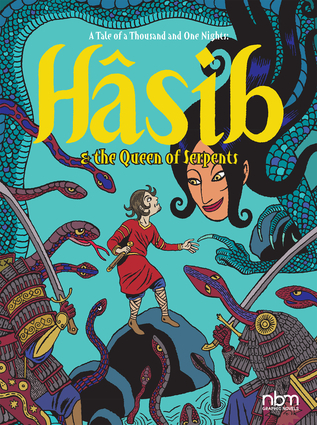 Heir to the wise Daniel, Hâsib is a young woodcutter promised to a great future. When his greedy companions abandon him in the middle of the forest, he meets the Queen of Serpents. She then tells her story, a fabulous adventure filled with gods and demons, princes and prophets. From Kabul to Cairo, journeys intertwine with intrigues and spiritual quests while the fabulous nights follow one another. An enchanting and intricately designed interpretation of the story of Hâsib Karîm ad-Dîm, through which David B. opens for us the gates of the Thousand and One Nights. For mature readers. David B. is one of France's finest cartoonists and a co-founder of the legendary L'Association collective. He is a multiple Eisner award winner and nominee. He is the author of many books of comics including The Armed Garden, Noctural Conspiracies, and Epileptic which was awarded Angoulême International Comics Festival Prize for Scenario and the Ignatz Award for Outstanding Artist. He lives and works in Paris, France.